Listen to executive producer Edie Magnus’ experience studying Hamilton High’s initiatives in addressing the emotional problems with their students or read about it below. Remember when the No Child Left Behind Act became law? President Bush signed it in a ceremony at Hamilton High school – which that day stood for schools everywhere in the mission to bolster academic standards across the country. Well, 5 years later Hamilton High stood for what’s happening in many of the nation’s schools in another, far more disturbing way: there were four student suicides there within months of one another. When i first spoke with the principal he was agonizing over the question of why it had happened and what they had missed. All four teenagers had died by hanging. No Child Left Behind as principal Dennis Malone would tell us later, may have required schools to increase test scores or attendance, but there wasn’t one indicator to show that a school had increased its attention to students with emotional problems. 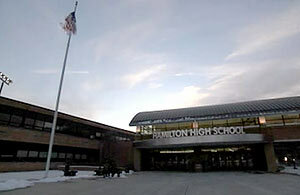 So Hamilton High took it upon themselves to do a better job in this area – and in our documentary Cry for Help you will see what they put together and you can judge for yourselves how they do. For teachers and counselors and administrators it’s all extra time and extra work, but they all told us it had to be done. School is where all the kids are – for most of their days, anyway. And in today’s world, where both parents often work, the folks running the schools are best positioned to reach the teenagers at risk who come through their doors everyday. See what you think of what they call Character Day: Hamilton High actually suspended classes for a day to spend time with students studying their emotional well being. And there’s a crisis team – which is put to the test. There are many different initiatives being launched across the country now – often in the wake of tragedy – to get at the problem of adolescent mental illness and feelings of suicide. Hamilton High’s is just one of them. What you will see represents a start. With 28 teenagers taking their own lives every week in this country, it’s a start along a path from which schools are finding they can’t turn away.